That's right people, you're getting a double tall mod world today. Two shows in one. Two times the suave. 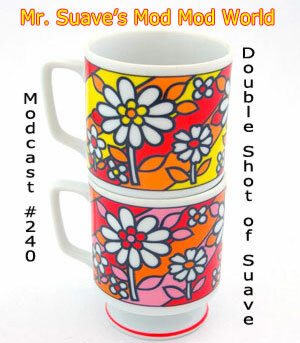 It's kinda like a double album, that's because the first part is Modcast #240, and the second half of today's show is actually a soul show I recorded for the very excellent Mod Soul Review podcast. A while back I was invited to guest host the Mod Soul Review show and this is what I turned in. Dean Stickley (be sure to check out his Mod Mod World guest hosting gig) who runs Mod Soul Review kindly said I could rerun the show on the Mod Mod World, and so here it is.